May is Cystic Fibrosis Awareness month. I will be sharing things about CF that you may or may not know throughout the month. I will start with this little tid bit to make you come back for more. 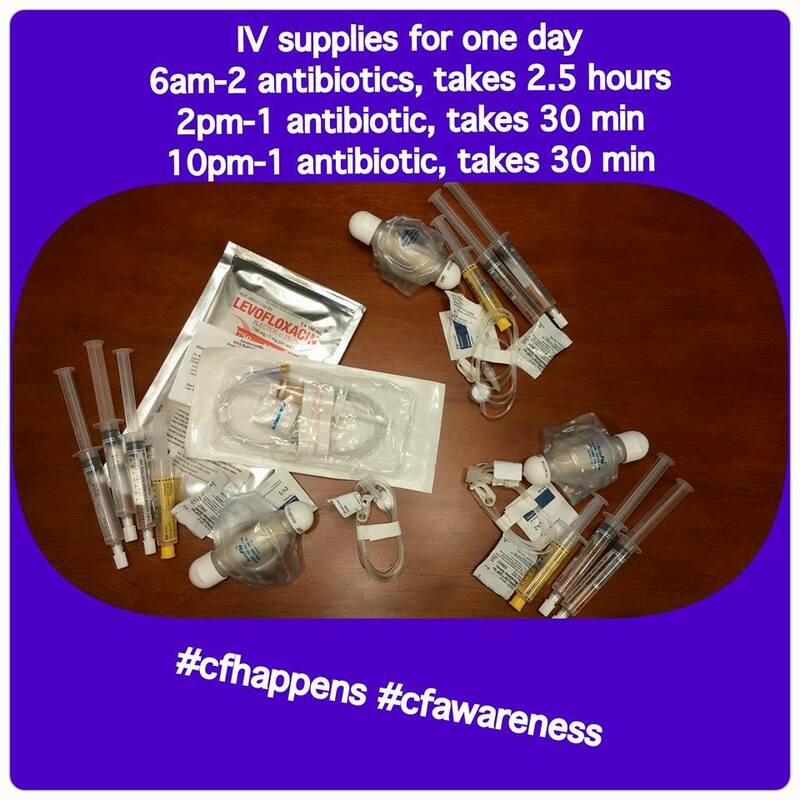 I started IVs at home yesterday, what a way to celebrate CF awareness month huh. I had to access my port so that I could get started. Here is a pic of what the process entails. 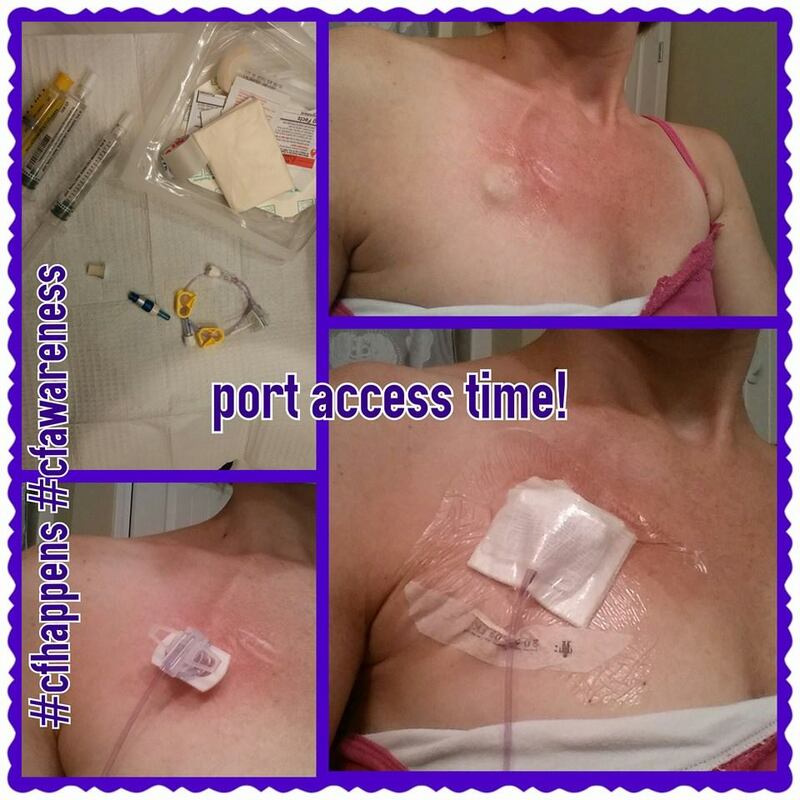 I am able to access my own port which helps things go faster. The port is under the skin. I put a right-angled needle in the center of it in order to do my IVs. 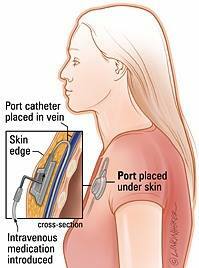 The sketch is what my port looks like under the skin. The bottom picture is one days worth of my IV supplies. Next up is breathing treatments. As you can see in the picture, I am hooked up to these machines multiple times a day. Here is what my day looks like right now…..
Go to bed and toss and turn while coughing trying my best to ward off a coughing attack so that I can just sleep. The “CF alarm” goes off aka coughing too much to stand. I usually give in and get up anywhere from 3am-5am and do a breathing treatment to hopefully calm my cough enough to get back to sleep. Get back to sleep then my husband’s alarm goes off at 5am, 5:30am and 5:45am. I kind of go back to sleep while he is getting ready for the day. When on IV, like today, I hook up to my first medicine between 5:30am and 6am, it runs for 30 min. I set a timer so that I can fall back asleep. When the timer goes off I flush my IV and hook up to the next one which takes about 2 hours. When the timer goes off for that one I flush my IV again and go back to sleep for as long as possible. Oh yeah I am also making sure my bonus son is up and out the door on time for the bus in that time. When I actually get up I do a breathing treatment which takes about 20-25 min. I eat and take all the pills I have to take and then I am free for a little bit. Then comes 2pm when I am due for another dose of IV and breathing treatment. This breathing treatment takes about 10 min. Then I’m free for a little bit again. Another breathing treatment around 6pm. Dinner and pills that need to be taken. Lastly the final IV dose of the day at 10pm along with another 20 min breathing treatment. Then it is bed time and I get to do it all over again the next day. I fill in the times between doing breathing treatments and IVs with all the “normal people” things like cleaning house, doing laundry, running errands, running kids to and from places, walking the dogs, lunch with friends, doctor appointments, spouse things on base, TV/DVR, family time, yard work and much more. Yes, taking care of myself is a full-time job as you can see. This is what I know, it is my normal. I push myself to do more than I should at times but I never want to look back and regret not doing something when I was able. As time passes on things will become more difficult therefore I take pride and joy in doing all that I can right now in this moment. Please feel free to share my blog to spread awareness. Also wear purple to show support. 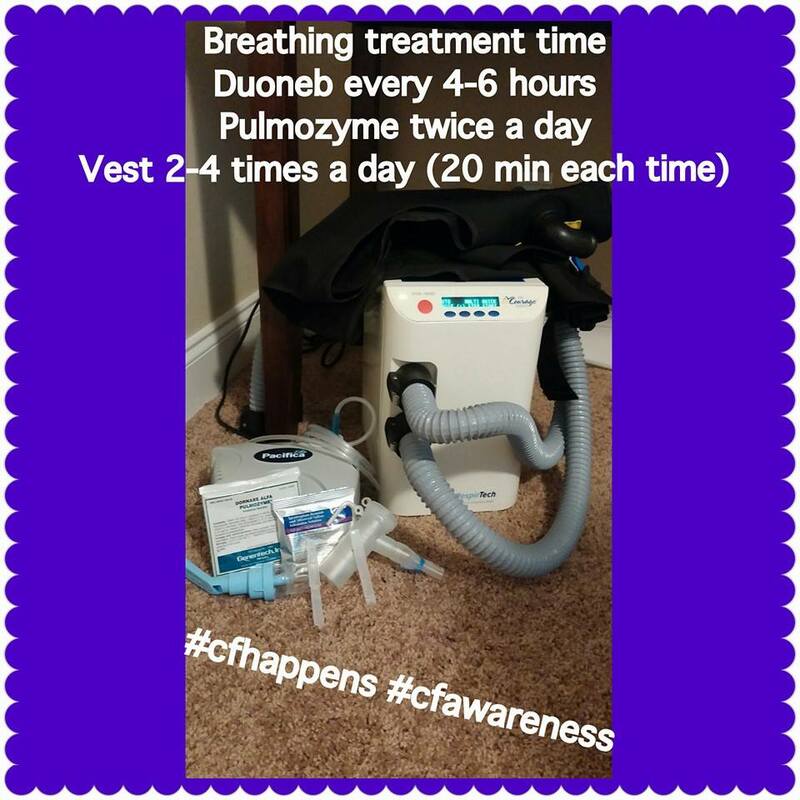 This is your first installment of CF Awareness and CF does just happen sometimes.